I have a party on facebook every Friday! I usually have a theme such as share you favorite recipe day. I want to try every recipe that is shared! I am so inspired by the recipes that are shared! This recipes was shared by The Southern Fried Bride! As soon as I saw the picture of this fabulous cake and read the ingredients, I couldn’t wait to make it! Seriously, I didn’t wait five minutes!! It is so delicious! Preheat oven to 350 degrees. Spray bundt pan with cooking spray. In large bowl, combine brown sugar, eggs, butter and apple juice. Mix until smooth. Add dry ingredients and mix until combined. Fold in apples to mixture. Pour batter into pan. Bake for 50-60 minutes, until toothpick inserted in cake comes out clean. Cool in pan at least 15 minutes. Invert cake from pan onto rack to cool completely . Combine both ingredients in mixing bowl. Stir until smooth. Adjust consistency, if needed, by adding an additional 1/2-1 tablespoon of apple juice. Drizzle glaze over cooled cake and let set before serving. I live in south amerika, how much grams is a stick butter? I had this recipe and lost it, thank you for posting it. So happy you found it Sarah! yes, I tried changing it three times but it wouldn’t change so I gave up, thank you for voting, you can vote every 24 hours! This cake looks delicious. Thank you for sharing this with us during Our Little Family Adventure’s Community Party and helping me celebrate my birthday. I hope you’ll join us again this Friday for another Community Party http://www.facebook.com/ourlittlefamilyadventure. I’ve started following you on WP and look forward to your future endeavors. This looks incredible!! Can’t wait to try it! I hope you enjoy this wonderful cake! I will try everything that is Apple Cinammon recipes in it and I just tried your recipe. Wow!!!! Its really great my kids and husband loved it and when I make 5 cakes for my staff yesterday, what’s left for me is just a container that has been emptied. 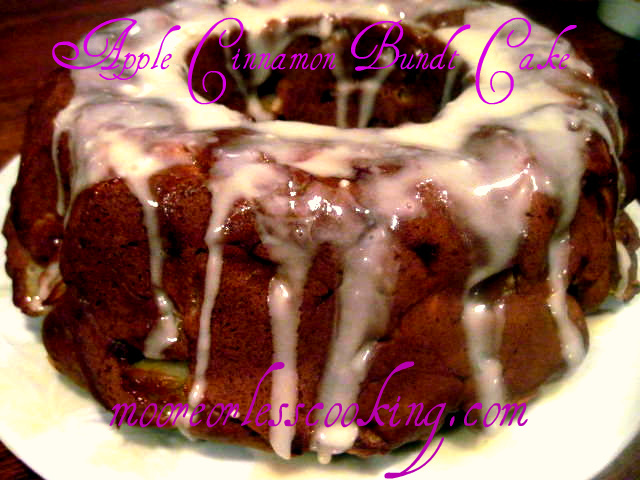 Made the apple cinnamon bundt cake & was very surprised about the cooking time. It says 50-60 mins. I set my oven for 45 mins. and it was done. I’m hoping that I took it out before it became over cooked. I just tasted it. I still must frost it and then I think I’ll take it to church and see what the congregation has to say. I think it could be a little more moist. This cake is so great I could sit and eat it by myself. I add raisins. Yummy!